Thursday, Mar. 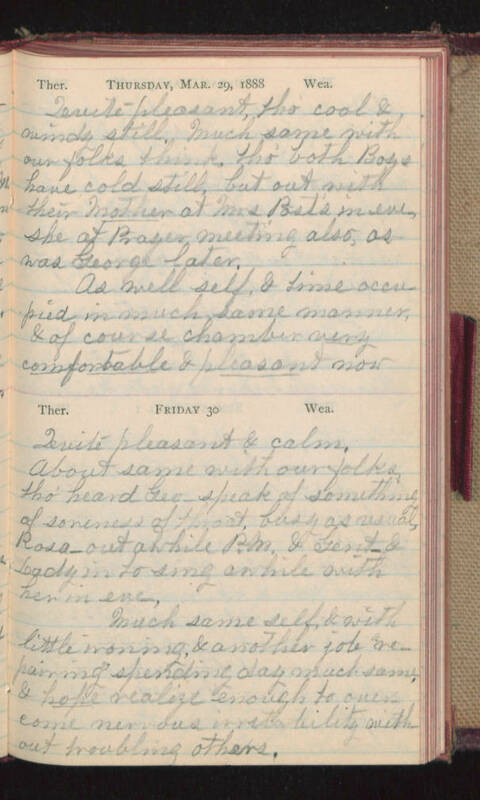 29, 1888 Quite pleasant, tho' cool & windy still. Much same with our folks think. Tho' both Boys have cold still, but out with their Mother at Mrs Post's in eve, she at Prayer meeting also, as was George later. As well self, & time occupied in much same manner, & of course chamber very comfortable & pleasant now. Friday 30 Quite pleasant & calm. About same with our folks, tho' heard Geo speak of something of soreness of throat, busy as usual, Rosa - out awhile P.M. & Gent- & Lady in to sing awhile with her in eve. Much same self, & with little ironing, & another job "repairing" spending day much same & hope realize enough to overcome nervous invertability without troubling others.